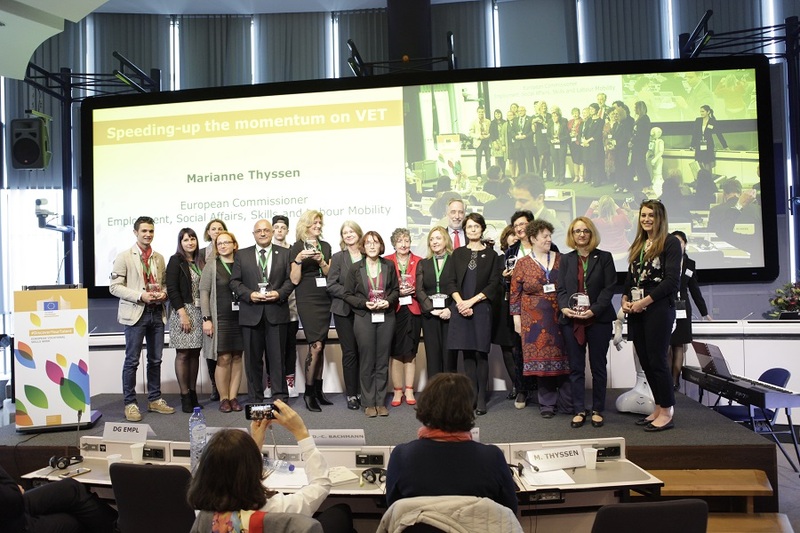 The European Commission initiative brought together schools, EU agencies including Cedefop, national and regional authorities to celebrate all things vocational education and training (VET) from 1 September till the end of the year. Cedefop has contributed with various events and active input in November’s Brussels showstopper. It started with the policy learning forum on apprenticeships (7-8 September), followed by the first European guidance week, organised jointly with the Estonian EU Presidency and Foundation Innove (25-29 September), a peer conference on the impact of the national qualifications frameworks, organised jointly with the European Commission (9-10 November) and ReferNet’s annual plenary meeting (29-30 November). In addition, the first-prize winners of the #CedefopPhotoAward 2017, Edita Aleksandravičienė and Irena Masandavičiūtė from the Siauliai Vocational Training Centre in Lithuania, received their trophy from European Commissioner for Employment, Social Affairs, Skills and Labour Mobility Marianne Thyssen at the week’s closing ceremony in Brussels on 24 November. Their model, young barber Svajūnas Pranaitis, and their photography teacher Lina Masandavičiūtė were also honoured at the ceremony. The Brussels events included a conference on promoting the vocational skills agenda, the first European business-education summit, and the closing awards presentation. At a session on a sector skills alliances blueprint for cooperation, Cedefop expert Stelina Chatzichristou gave a keynote speech on skill needs identification. She stessed the impact on skills of ‘megatrends’ such as demography, technological developments, automation and climate change, focusing on the sectors of the second phase of the blueprint: additive manufacturing; construction; green technologies and renewable energy; maritime shipping; the paper-based sector; and steel industries. Ms Chatzichristou also highlighted the value of sources such as the Skills Panorama portal and other related Cedefop work. A third vocational skills week has already been announced, to take place in Vienna (5 to 9 November 2018) in the framework of the Austrian EU Presidency.